Chloe could read books all day long, so we spend a lot of time in her room plowing through stacks of them. Often when there's a picture or mention of food in a book she loves, Chloe becomes intent on having some for herself. That's exactly what happened when we first read I Am Not Sleepy and I Won't Go To Bed, one of the books in Lauren Child's awesome Charlie and Lola series. For the next few days, all Chloe asked for to drink was Strawberry Milk, which is Lola's favorite. I wanted to get some, but I wasn't thrilled with the idea of buying what passes as pink milkat the grocery -- milk mixed with lots of sugar and food dyes. Instead, Chloe and I came up with this recipe. Simple, creamy and above all....PINK (which makes Chloe endlessly happy), this is one of those simple recipes which we'll most definitely be making again this Valentine's Day while we're curled up on the rug reading Charlie and Lola (and a lot of our other favorite books) and thinking up new recipes based on whatever we find in the pages! 1. Place the ingredients in a blender and puree until smooth. Adjust the amount of sweetener according to your preferences. I just made this. Delicious! Great way to use fresh strawberries before they turn. My 14 month old drank almost the whole cup without taking a break. I love the addition of honey. I wish I made more for myself! Yum! I am going to do this vegan with almond milk. A great Valentine treat. Great idea. The recipe works perfectly with almond, rice and soy milk too! Sounds yummy. I am going to have to make some for my kids. My daughter loves the Charlie and Lola books too. I made something like this yesterday for my girls, except I added very ripe bananas to the mix. They slurped it down in seconds! Made this w/ my 4 year old this morning. She was in heaven, it's her very first pink milk! 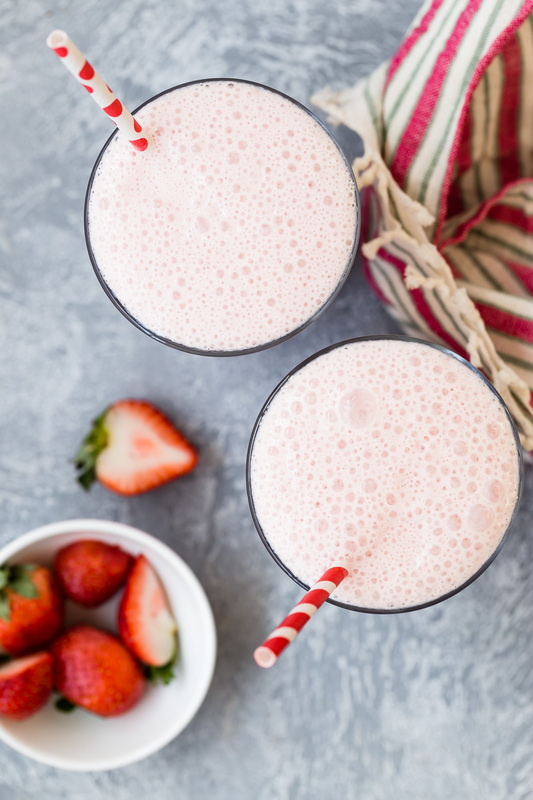 Used soy milk, organic strawberries, and agave. Thanks! Just made this with my son. Very tasty! He loved it! We watched your video and he asked if he could watch Chloe again! What a cute idea! Great way to use the strawberries left over from my cupcakes :)Thanks!! What a cute idea! Great way to use the strawberries left over from my cupcakes Thanks!! I've made this before - yummy! I made this to accompany our special Valentine's meal and my son just adored it. I love giving him something that makes him feel special and I feel good giving to him. Super easy too! My daughter &amp; I made this with almond milk &amp; stevia for a quick dessert tonight. Yum! I've had a nearly identical scenario with my 4 yr old wanting pink milk and me trying to find a healthy alternative to the shelf stuff in the grocery store. 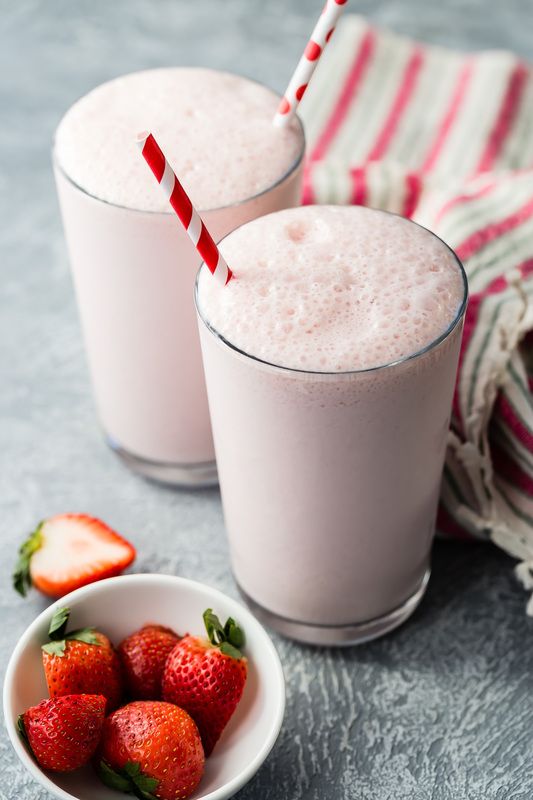 I have made this with fresh and frozen strawberries, but I've also used freeze-dried strawberries from Trader Joes (no sugar or sulphur added), with honey and I must say, I like it better! It's still just as healthy and shelf stable. Just wanted to share. I didn't get a chance to make this for Valentines day, but it was a life saver while scrambling around the kitchen looking for a treat for my twin girls. I threw in some almond milk, frozen organic strawberries, silken tofu, and organic vanilla yogurt for sweetness in to my blender. Turned out great! Thanks for the awesome recipe! This was a hit with one of my boys who loved it - we use soy or almond milk. Do you know if this stores well if I ,make a bigger batch or will it settle funny? I'd really would love to know since my son has now decided not to drink just plain soy or almond milk whenever I serve it - which is with breakfast, lunch and dinner. What a great idea! My boys loved it. I really love that you have great recipes that are easy and healthy. Thank you for providing such a wonderful resource! Oh, and I added a tablespoon of Chia seeds as well.